It's odd that the most patriotic superhero of all, in the United States at least, is the one who has failed to take off. 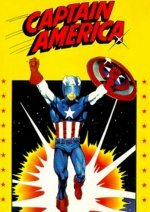 In this TV movie, Reb Brown has the necessary physique but little else as he dons the stars-and-stripes costume to save Phoenix from being blown up by a neutron bomb. An even sillier sequel followed, and there was a movie version in 1990, but in both cases the concept failed to grab the public's imagination.